Recently, in the advancement of scientific technology, CRISPR, a genetic modifier, has been a significant advancement in the past few years. CRISPR allows living things the ability to change it's original DNA, by adding or removing specific genetic material from a specific location in the genome. CRISPR is already being used to modify plants and animals to learn more about how to edit human genomes. Scientists are working hard to find a way CRISPR can treat life-threatening diseases, and ways to improve our environment and economy. After years of experimentation and research, scientist discovered a way to improve CRISPR that is affordable, easy, and safe for humans that can lead to more precise gene editing. Molecular biologists worked hard to find that Cas9, which is an enzyme used in CRISPR, is not as effective and precise as the protein Cas12a. There was a study done that determined Cas9 was not accurate and edited inaccurate parts of the genome, disturbing normal healthy functions. If scientists continued using Cas9 it has the ability to turn healthy cells into cancerous cells, ruining all of the progress they have made. Cas12a is a safer and clear-cut route because "it binds like Velcro to a genomic target, whereas Cas9 binds to its target more like super glue." (University of Texas at Austin, 2018) Cas9 is more like super glue because it only pays close attention to the first few letters of a genomic target, and slowly dismisses the rest of the process, allowing for mismatches and editing of the wrong part of the genome. While, Cas12a is like Velcro because even though the bonds are slightly weaker than Cas9, it has precise matching throughout the entire genome strip holding it together the entire way, instead of only in the beginning. Cas12a allows for the edit accurately through the entire genome, checking each base pair for accuracy as it proceeds on to the next one, instead of stopping after the first few letters. In conclusion, even though Cas9 and Cas12a, are no where near perfect, Cas12a has room for improvements. 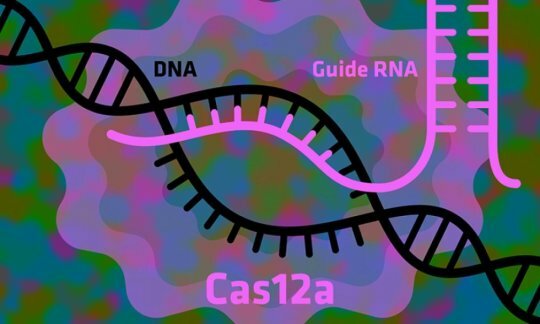 With further testing and experiments regarding Cas12a scientists will be able to provide the best form of CRISPR to people in need. Very interesting. In my own research, I've seen that CRISPR has a tendency to change genes that are not in the target location. With more uses of CRISPR in research and clinical settings, there needs to be improvements to the technique and it seems like it is going in the right direction.